More than 50 ar­rests have been made while 108 charges have been laid against per­pe­tra­tors of crimes against chil­dren so far this year. Ministry of Social Development and Family Services Permanent Secretary Jacinta Bailey-Sobers makes a point during yesterday’s JSC into the prevalence of teen pregnancies at Parliament, Port-of-Spain. State en­ti­ties re­main trou­bled that they are un­able to iden­ti­fy hun­dreds of adult males who im­preg­nate teenage school girls. A Ja­maican na­tion­al who is the co-own­er of a phar­ma­cy in Mara­bel­la was kid­napped from his home in Palmiste, San Fer­nan­do, on Sun­day and a US$6 mil­lion ran­som de­mand­ed for his safe re­lease. Ja­maican dance­hall artiste Bu­ju Ban­ton has been grant­ed per­mis­sion to en­ter T&T this week­end for the “I am Leg­end” con­cert. Firemen continue to battle with the bush fire which has been burning for five days now in Mahaica, Point Fortin. To­day marked the fifth day that res­i­dents of Ma­haica in Point Fortin have been cop­ing with thick smoke em­a­nat­ing from a huge bush fire. How­ev­er, they were giv­en a small “Bligh”. A Debe man’s life was spared by gun­men who held him down while they shot and killed his friend yes­ter­day. Homes at Ridgeview Heights, Bon Air, North. With a view to chip in­to the hun­dreds of thou­sands of list­ed ap­pli­cants for HDC hous­ing, Hous­ing Min­is­ter Ed­mund Dil­lon says all ef­forts will be made to com­plete stalled hous­ing projects all around the coun­try. Chief Sec­re­tary of the To­ba­go House of As­sem­bly (THA) Kelvin Charles has said that cit­i­zens have a re­spon­si­bil­i­ty to help peo­ple with dis­abil­i­ties to live as much of a nor­mal life as pos­si­ble. Veteran fisherman Maheshwar Roopchandsingh said their demise could have been avoided. As day four passed with no sight of dou­bles ven­dor Sie­u­nar­ine Gyan­dass and his work­er Videsh Mar­lo, who dis­ap­peared at sea, vet­er­an fish­er­man Ma­hesh­war Roopchands­ingh said their demise could have been avoid­ed if they knew about safe­ty at sea. 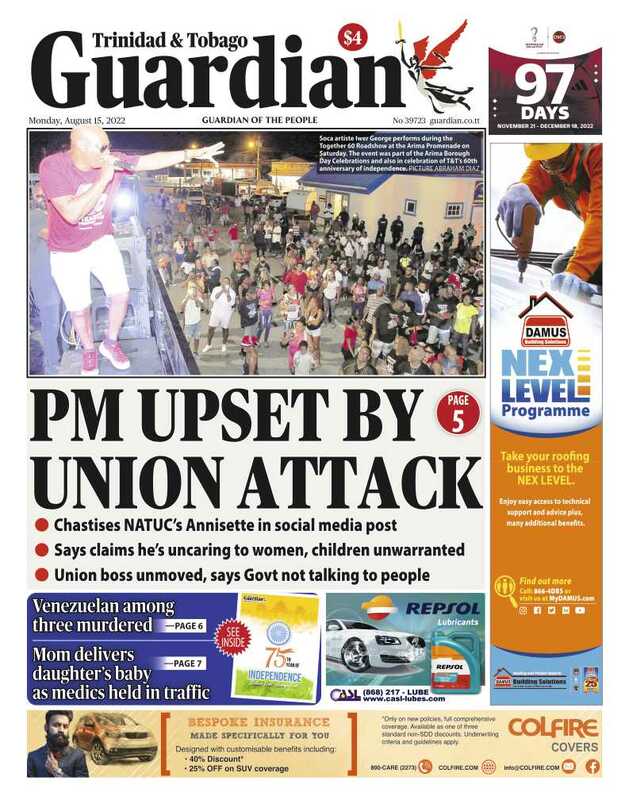 Pres­i­dent of the Sea­men and Wa­ter­front Work­ers Trade Union (SWW­TU) and Gen­er­al Sec­re­tary of Na­tion­al Trade Union Cen­tre (NATUC), Michael An­nisette has con­grat­u­lat­ed the cap­tain and crew of the T&T Spir­it for res­cu­ing four strand­ed fish­er­men at sea dur­ing the ves­sel's reg­u­lar jour­ney to Scar­bor­ough. Se­cu­ri­ty of­fi­cers at­tached to the Wa­ter and Sew­er­age Au­thor­i­ty (WASA) have laid charges against three peo­ple for the il­le­gal ab­strac­tion of wa­ter from the au­thor­i­ty’s wa­ter works sys­tem. They have al­so been charged with il­le­gal tam­per­ing with a fire hy­drant, con­trary to Sec­tion Six of the Wa­ter Works Act 54:41. Po­lice of­fi­cers who re­spond­ed on the scene along the Churchill- Roo­sevelt High­way where a teenag­er threat­ened to jump off a walkover have ex­pressed deep con­cern over what they de­scribed as the in­creas­ing or deep­en­ing ills in so­ci­ety, es­pe­cial­ly among young peo­ple. Po­lice have charged a 15-year-old boy with ar­son in re­la­tion to an in­ci­dent which oc­curred in the Ma­son Hall dis­trict over the week­end. The Oil­fields Work­ers’ Trade Union (OW­TU) is ac­cus­ing T&TEC and the Min­istry of Health of col­lud­ing to cov­er up the im­pact of tu­ber­cu­lo­sis (TB) among the com­mis­sion’s em­ploy­ees. Prime Min­is­ter Dr Kei­th Row­ley has re­fut­ed al­le­ga­tions made by Op­po­si­tion Leader Kam­la Per­sasd-Bisses­sar that the Elec­tions and Bound­aries Com­mis­sion (EBC) has been con­spir­ing “to thief” and “pad” the up­com­ing Lo­cal Gov­ern­ment Elec­tions and Gen­er­al Elec­tion. A Chi­nese man and his Venezue­lan girl­friend, who are fac­ing 43 crim­i­nal charges from an al­leged pros­ti­tu­tion ring in west Trinidad that was bust­ed in Feb­ru­ary, will have to spend an­oth­er month in prison be­fore they can ap­ply for bail. A farmer from Ch­agua­nas has lost his mul­ti-mil­lion dol­lar law­suit against a con­trac­tor for al­leged­ly de­stroy­ing his paw paw plan­ta­tion while per­form­ing road im­prove­ment work six years ago. Po­lice have launched an in­ves­ti­ga­tion in­to the con­duct of po­lice of­fi­cers who were on du­ty at the Ch­agua­nas Po­lice Sta­tion on Sat­ur­day, when a re­port of rob­bery with vi­o­lence and ar­son was made by a fam­i­ly of four. President of the Tobago Hindu Society Pulwattie Beepath, right, and THA Chief Secretary Kelvin Charles light deyas at 2018 Divali Celebrations. The To­ba­go Hin­du So­ci­ety (THS) has called on the Sec­re­tary Gen­er­al of the Sanatan Dhar­ma Ma­ha Sab­ha (SDMS), Sat Ma­haraj, to apol­o­gise to all To­bag­o­ni­ans for his re­cent state­ments about the work ethics of To­bag­o­ni­ans. The head office of the Water and Sewerage Authority (WASA) in St Joseph. Se­cu­ri­ty of­fi­cers at­tached to the Wa­ter and Sew­er­age Au­thor­i­ty (WASA) have laid charges against three per­sons, for the il­le­gal ab­strac­tion of wa­ter from WASA’s wa­ter­works sys­tem, as well as il­le­gal tam­per­ing with a fire hy­drant, con­trary to Sec­tion 6 of the Wa­ter Works Act 54:41. Teenager Nathaniel Callendar, 17, sits on top of the La Horquetta walkover, as his friend Daniel Orvon-Alexis speaks to him with emergency service officers looking on. Callendar eventually came down safely. A teenage stu­dent who climbed on top of a walkover near Tumpuna Road, La Hor­quet­ta has safe­ly come down. THS President Pulwattie Beepath right, with her daughter Sita and son-in-law Akeil Combie at their wedding last August. The To­ba­go Hin­du So­ci­ety (THS) wants Sat Ma­haraj, Sec­re­tary Gen­er­al of the Sanatan Dhar­ma Ma­ha Sab­ha (SDMS), to apol­o­gize to To­bag­o­ni­ans for his re­cent state­ments about their work ethics. The T&T Spirit docked at the Scarborough Port. Prime Min­is­ter Dr Kei­th Row­ley has tak­en um­brage with claims by Sanatan Dhar­ma Ma­ha Sab­ha sec­re­tary gen­er­al Sat Ma­haraj that To­bag­on­ian men are lazy rapists.